This page shows the list of all cards players can get from the first pack, Ultimate Rising with their rarity. The Ultimate Rising will be available again from May 17th! This is the first booster pack in Yu-Gi-Oh Duel Links. If you're aiming to get your 2nd or 3rd Sphere Kuriboh. Having 2 or 3 copies of Sonic Bird. Getting useful support cards such as Order to Charge, Masked of the Accursed, 4-Starred Ladybug of Doomed, Secret Pass to the Treasure, and handul of farming cards can be found in this box. The best card that you must obtain from this box. Suitable to any kind of deck. Nothing much to say about this card, its effect says it all. When this card is Normal or Flip Summoned, you can add 1 Ritual Spell Card from your Deck to your hand. If you're planning to build Relinquished 3 copies of it is a must. Any ritual deck fits this card. Harpies' Hunting Ground, Venus (Switcheroo), Magnet Warrior. This card can fits to most deck that is built with normal monsters. Here are some decks that need cards from the Ultimate Rising to make them competitive in the current Duel Links meta. Dream Clown Destroys your oppnent's monster when the battle position is switched from Atk to Def. Wonder Balloons By throwing some cards away from your hand to the graveyard, decreases the Atk of monsters your opponent controls. 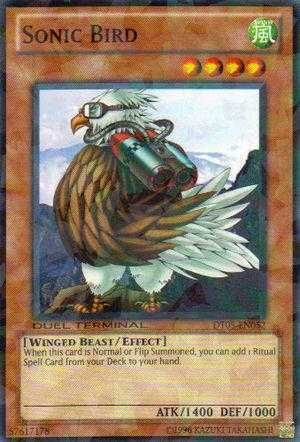 Sonic Bird Sonic Bird will activate immediately after you summon it to search for a ritual spell card. 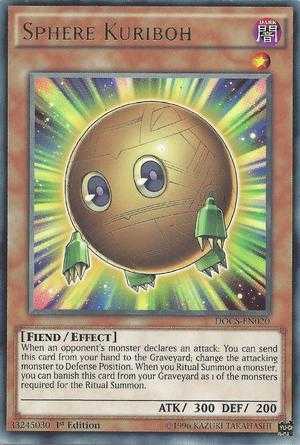 Sphere Kuriboh You can banish this card from the graveyard to ritual summon Relinquished since it is Level 1 ritual monster. Fulfillment of the Contract Gets your ritual monster back to the field. Note that a ritual monster needs to be ritual summoned properply once before. Order to Charge Use this card to destroy a monster by tributing Mystical Shine Ball special summoned by the effect of The Venus. White Elephant's Gift Allows you to draw 2 cards by tributing a normal monster. Mystical Shine Ball is the best to be tributed. Mask of the Accursed Prevents the equipped monster from being able to attack, very useful in combination with defensive decks, especially parasite infestation deck that can help burn your opponents faster. 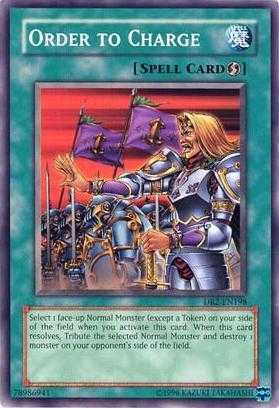 Here are cards frequently used for getting high-score against certain Legendary Duelists (LDs). Those cards are worth to get in case. The Hunter with 7 Weapons Some LDs use certain monster types only in their decks, this will make hunter with 7 weapons have 2,000 attack at all times. No tribute needed. 4-Starred Ladybug of Doom A lot of LDs use level 4 monsters and not tribute often, this can effectively destroy multiple monsters on the field with only 1 card. Effective in PvP as well. Shard of Greed This will help you draw some cards which can speed up farming decks, or search for the needed card faster. Secret Pass to the Treasures This will allow cards like Piranha Army or Gravekeeper's Vassal to be able to attack directly. Both of those cards are often used in many farm decks. Magic Jammer In case you need more cards than 3 Riryoku Field to negate the activation of Kaiba's Enemy Controller. Ready for Intercepting Ishizu's Gravekeepers monsters are Spellcaster-type. Use this card to prevent them from attacking your monster. Enchanted Javelin Used with Des Counterblow and Destiny Draw skill to farm Seto Kaiba Lvl 40. Nutrient Z Against some LDs with high attack monsters, this will heal your LP instead of lowering it when you get attacked. This is the very oldest box and its impressive that after two years the UR Sphere Kuriboh is still viable and important. It provides a much needed hand trap for Duel Links. Hopefully they introduce a few more before WCS 2019. I miss Karate Man OTK. Servant of the kings is probably the best deck. Not especially low. On average, there'll be 1 UR left in the last 20 packs (200 packs, 10 UR's). So that's what, a 2/5 chance it'll be in the last 8, or about 40%. Is this box really being removed again? I dont hope so because I´m pretty new to this game and this pack has some good cards. If it gets removed when will it be?